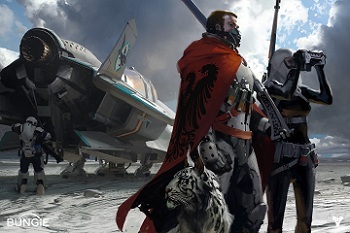 Destiny's multiplayer public events will be "open frontiers," with no lobbies or loading screens. In most games, when it comes time for some online multiplayer fun, players generally organize themselves in a lobby before dropping in on the action en masse. But Bungie says Destiny will forgo all that extra-game horsing around in favor of far more natural and organic encounters between players. "To join a public event, all you have to do is get within range, and open fire," Bungie Community Manager David "DeeJ" Dague explained on the PlayStation blog. "No lobbies. No loading screens. The frontier is open, and filled with encounters you can join, or skip right past, on your way to something you've deemed momentarily more important." Destiny's "core cooperative nucleus" are Fireteams of three Guardians, but other Guardians - and presumably multple Fireteams - can come together to handle some of the more challenging situations that will come up in public events. Players who prefer to go it alone may do so, but Dague implied that they'll be missing out on the fun. "You can experience Destiny's story as a party of one, assuming you're that much of a badass. Destiny will never require you to team up with other people in campaign missions. You'll see other players along the way, but you can choose to ignore them," he said. "That said, we think you'll find that playing with other Guardians is quick, painless, and a ton of fun. It's always your choice, though." Destiny is currently expected to launch sometime in the second half of 2014 for the PlayStation 3, PlayStation 4, Xbox 360 and Xbox One. Bungie announced yesterday that the Destiny public beta will begin early next year.